"We're here because we're not all there." long-time Atlin resident. if I can, what I did today will probably do it." 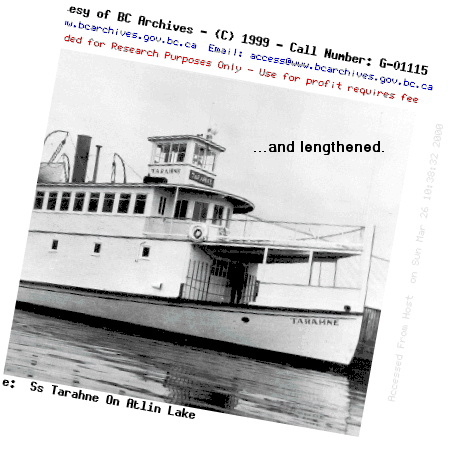 "Atlin's had only two good years, 1898 and next year." The Taku River Tlingits trekked hundreds of miles in their annual migration from Juneau AK, up the Taku River and over the watershed to the Atlin Valley and back. They visited Atlin, Teslin, Carcross even before these places had these names. When gold was discovered in Atlin in 1898, gold seekers from the south poured into Skagway AK and began the quest northward: north over the White Pass and eastward over the Fantail Trail, on foot and then by boat, to Atlin Lake. By 1901, The White Pass Railway was constructed from Skagway AK to Whitehorse Yukon. It covered about 120 miles, with stops along the way. So... In 1901, if you were seeking Klondyke Gold in Atlin, how would you and your gear get from Vancouver to Atlin? Take a steamer north to Skagway; take the White Pass Railway north to Carcross, about 60 miles. Then, you'd make your way by boat or on foot, south on Tagish Lake, then east to Atlin Lake. Over the years, as Atlin became a popular destination with miners and tourists alike, the route evolved to be less of a hardship and more of an adventure. 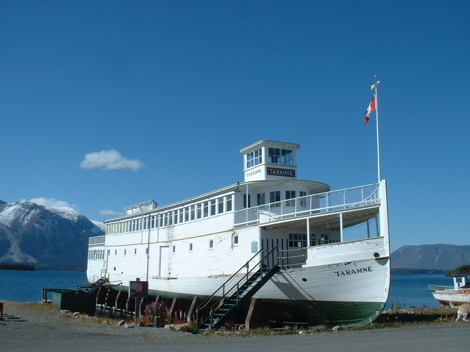 By 1917, you'd board a paddlewheeler at Carcross; sail southward on Tagish Lake to Taku Landing. There, you'd take the Taku Railway, the World's Shortest and Most Expensive Railway ($2 for 2 miles) across to Scotia Bay on Atlin Lake. 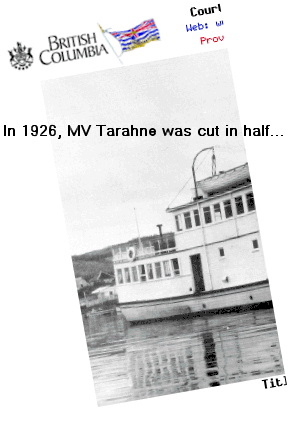 Then you'd take the MV Tarahne 4 miles across the lake to Atlin. Atlinites don't do anything by halves. when times are bad, you can't afford to." That means it has no local government structure. 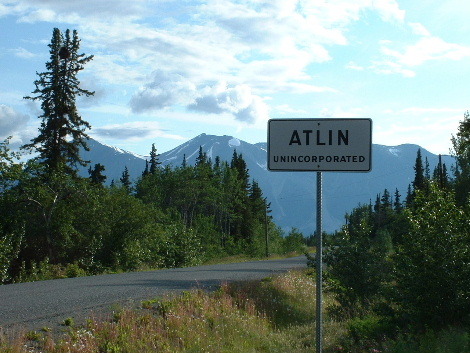 It is not a village, nor a town, nor a city; it does not have a mayor or a reeve or a councilor… Atlin has no local municipal government, and is not part of a regional district. The Taku River Tlingit First Nation is self-governed, but the Atlin community as a whole, and that includes the TRTFN, is unincorporated. Atlin has once again been asked by the provincial government to undertake a governance study. This has happened several times. The report was ready in late 2007; it proposed an "Enhanced Improvement District"; a public referendum was held in February of 2008. The outcome of that, as of January 2009, is that we now have ACID ie: Atlin Community Improvement District. It combines the Atlin Improvement District and the Atlin Advisory Planning Committee. We're still unincorporated! Much of Atlin is run by volunteers. Volunteers make enormous contributions of time, energy and other donated resources. When Atlin people want something, they give of their limited resources and go after it. Atlin volunteers are persistent. Without our volunteers, Atlin would have no voice with government, and very few basic community services. Overheard in the Post Office Lobby: "But it can't be his baby; he's had a vasectomy." No secrets here.